The ConVeX consortium has announced Europe’s first live demonstration for C-V2X direct communication interoperability between a motorcycle, vehicles and roadside infrastructure. AUDI AG, Ducati, Ericsson, SWARCO, the Technical University of Kaiserslautern, and Qualcomm CDMA Technologies GmbH formed the Connected Vehicle to Everything of Tomorrow (ConVeX) consortium last year to carry out the first announced C-V2X trial based upon the 3rd Generation Partnership Project’s (3GPP) Release 14, held the demonstration in Ingolstadt, Germany. 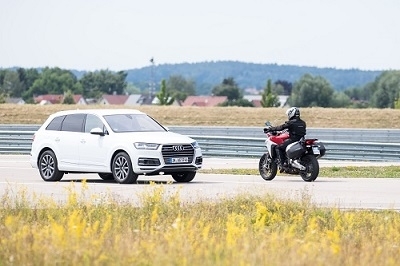 The demonstration featured Audi Q7 and Audi A4 road vehicles, as well as a Ducati Multistrada 1200 Enduro two-wheel vehicle equipped with C-V2X technology utilizing the Qualcomm 9150 C-V2X chipset solution. The showcase demonstrated common situations that can take place between motorcycles and vehicles, and how C-V2X technology can be used to improve road safety. These include Intersection Collision Warning, where a vehicle equipped with C-V2X technology pulls out from a junction with an adjoining road and avoids hitting a motorcycle rider who has the right of way, as well as Across Traffic Turn Collision Risk Warning, in which a vehicle avoids a left turn collision with a motorcycle. These use cases are part of a wider set of advanced applications that have been demonstrated through the ConVeX project, which also involves vehicle-to-infrastructure (V2I) communication using roadside infrastructure units developed by SWARCO and vehicle-to-network (V2N) communication using Ericsson’s 4G/5G cellular test network operated at the motorway A9 German digital test field.